Last Monday, July 2, I had the priviledge and great joy of donating to the Father Serra Pantry in San Juan Capistrano my first royalty check from the sales of The Death of Rafael. 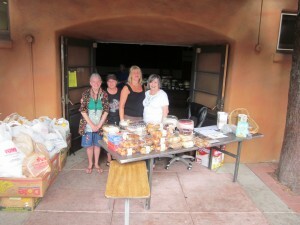 The Pantry provides vital foodstuffs and supplies for needy familes in San Juan Capistrano and surrounding areas. On any given day, 100 to 150 people are being served by the volunteers at the pantry on Camino Real, outside of the Mission Basilica. The local markets provide the bulk of fruits, vegetables, eggs, meat and fish. However, the markets provide mostly perishables and the pantry is always in need for cash donations so that it can purchase cooking oil, sugar, flour and other such staples. The mornings at the pantry start with volunteers preparing the food packages to be handed out–big bags with fruits, eggs, vegetables, etc. Also, if the people coming in for food stuffs have special needs–baby formula, some special food–the pantry can provide it. After the packages are prepared, the volunteers meet briefly before opening to exchange quick information and updates and then offer short prayers. The volunteers are from all walks of life, some members of the parish, other just wanting to give back to the community. This entry was written by admiNWD, posted on July 7, 2012 at 11:21 am, filed under The Death of Rafael. Post a comment or leave a trackback: Trackback URL. I’m going through it again. Very nice touch: p.67: “slit headlights”. I remember seeing those (blackout headlights). My father was in the Army, stationed in Germany just after the war (not much later than ’46 or ’47, with my mother and me, for about a year, in Berlin. The phosphorescent tags, though, were a bit before my time. Not only is the devil (as they say) in the details, it’s in the writing. Other details that connect the story to the real world: Generals Feldgiebel, Beck, Col von Stauffenberg, &c.
As an aside, for history afficianados, this next Friday marks the 68th anniversary of the plot. That didn’t come out right. More like “details make the writer”. Thank you for the comment. Reading it a second time. Oh dear. It was my Mom who told me about the phosphorescent buttons, passingly many, many years ago, but somehow that stuck in my mind. As for the slit headlights–no idea where that came from. I must’ve seen a photo or read it somewhere. As I wrote that, it made sense to the engineer in me–the beam would be forward only, and could not be seen from above.